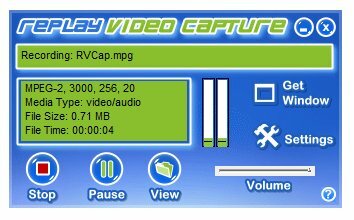 Replay Video Capture makes it easy to capture anything you can watch on your PC's screen as a production-quality video. It's the best way to make professional-looking videos from hard-to-capture web sites, DVD's, webcams, chat sites, and more. It supports dual monitors. Record your screen activity on one monitor while working on the other. Quickly make DVDs of your recorded files as Replay Video Capture automatically makes DVD ISO files in just minutes. It includes a proprietary MPEG-2 codec which provides un-parallelled picture quality while not slowing down your CPU. Setting up a recording is quick and convenient, and the results are amazing. You gotta give this a try. This has enabled me to capture impossible to capture high quality streaming video as well as any animated portion of my desktop screen that I want with a breeze. I have also employed this app to trim the width and height of videos such as getting rid of the black padding that comes with certain videos.